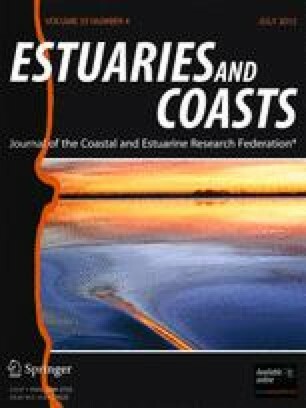 The mouth dynamics of temporarily open/closed estuaries (TOCEs) play a key role in their overall functioning. In this study, the effect of the inlet state (closed vs. artificially breached) on spatial variability of macrobenthic invertebrates (composition, abundance, and biomass) was assessed in a temporarily open/closed lagoon of South Brazil (28°35′S/48°52′W). Samplings were carried out in two periods during closed (July and November) and open phases (July and November). Additionally, in order to evaluate possible transitory effects of breaching, data obtained during closed and open phases were compared with those samples taken 60 days after the end of mechanical opening of the mouth (January). The artificial breaching markedly changed the dynamic of the benthic environment. After the inlet dredging and bulldozing, total organic content and microphytobenthic biomass were significantly reduced. The disturbance also resulted in a population crash of the macrobenthic invertebrates, with a reduction of 50% in biomass and 90% in density. Following the shock produced by the artificial breaching, most of the macroinvertebrates descriptors recovered, as shown by the univariate and multivariate analysis. However, a benthic community with a significantly different structure emerged. During the study, the macroinvertebrates from inner portions of the lagoon were less variable than those in the middle or near the lagoon inlet. The results of this study showed that the macrobenthic associations of Camacho lagoon were primarily structured by salinity and microphytobenthic biomass, which in turn, were regulated by the state of the inlet. The online version of this article (doi: 10.1007/s12237-012-9488-9) contains supplementary material, which is available to authorized users. This study was partially supported by FAMASC (Santa Catarina Aquaculture Federation), CPNq (Brazilian National Research Council) and the State of Santa Catarina Government. We are grateful to André Francisco for his help in field work and Alexandre do Farol for the assistance during all phases of the study. We also thank three anonymous reviewers for their suggestions that greatly improved the manuscript. CEPA. 2010. Centro de Socio-economia e Planejamento Agrícola—Epagri/Cepa. http://cepa.epagri.sc.gov.br/Publicacoes/Sintese_2010/sintese%202010_inteira.pdf. Accessed 10 March 2011. EPAGRI. 2011. Empresa de Pesquisa Agropecuária e Extensão Rural de Santa Catarina (Epagri). http://ciram.epagri.sc.gov.br/portal/website/. Accessed 20 September 2011.